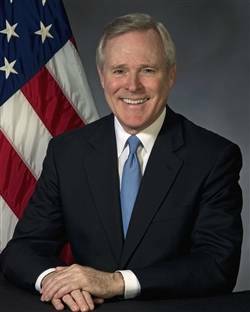 While the Navy already has one of the strongest counter-fraud efforts in the government, Navy Secretary Ray Mabus today announced new measures to assure contracting integrity and to prevent fraud. Mabus, who briefed the Pentagon press corps this morning, spoke amid a criminal investigation focused on Glenn Defense Marine Asia. The U.S. Department of Justice is prosecuting the case, which alleges the company overcharged the U.S. Navy for husbanding services throughout Asia. Husbanding is the services ships receive in port and covers everything from removing sewage to providing transportation to resupply. Some Naval officers have been arrested for their involvement in the scheme and Mabus expects more announcements as a result of the case. Mabus is proud of the work Navy personnel did in uncovering the plot. “The Naval Criminal Investigative Service, NCIS, along with the Defense Criminal Investigative Service, and the Defense Contract Audit Agency did and is doing incredibly impressive work to ferret out the alleged fraud and corruption carried out by GDMA and, yes, allegations against naval personnel, as well,” Mabus said. The investigation has been under way since May 2010. “Information gathered during this investigation was eventually turned over to government prosecutors and led to the recent charges filed in federal court,” Mabus said. This included charges filed against an NCIS agent. Throughout the investigation, Mabus repeatedly instructed NCIS agents to take the investigation wherever it led. “This is a very serious case, and it is a serious issue,” he said. The secretary has spoken with all three- and four-star admirals about the investigation and the changes he is making. This authority will be a four-star admiral who will ensure that if allegations are substantiated, individuals will be held appropriately accountable, Mabus said. Since 2009, Navy has suspended 252 contractors and debarred 400, the secretary said. Still, he said, the service must do more. Mabus is taking steps following receipt of a report reviewing acquisition strategies for husbanding and similar contracts worldwide. Experts are examining the husbanding contractor process from end-to-end and will recommend changes to correct deficiencies in those procedures and to provide maximum effective oversight of the process. When that task is finished, the Navy will issue a revised acquisition strategy that will be used on all husbanding contracts globally. The Navy will “further standardize requirements, further standardize contract vehicles, further standardize administration and increase oversight of husbanding contracts and contractors,” Mabus said. The Navy will increase the use of firm fixed-price line items and minimize the use and improve the oversight of unpriced line items. The service also “will remove pay functions to husbanding service providers from ships and provide better guidance on requirements and more contracting support ship COs going overseas,” he said. The Navy will also incorporate standardized requisition processes fleetwide, and the service auditor general will conduct a special audit of husbanding and port services contracts. That report is due in June 2014.